Adapted from the Multigrain Bread recipe in Cook’s Illustrated, March-April 2006. Special thanks for the idea of flax seeds to Peter Reinhart, from Roasted Three-Seed Bread in Brother Juniper’s Bread Book (1991). In 1991 Peter was still a Brother of Christ the Savior Brotherhood in Forestville, California. A couple of years later, I found Brother Juniper’s Bread Book at Green Apple Books on Clement Street in San Francisco and have treasured it since. Peter now teaches bread baking at Johnson & Wales University in Charlotte and he kindly autographed Brother Juniper’s Bread Book when I went to Johnson & Wales for a Saturday morning American Pie pizzamaking class that he taught. This sturdy dough does best as medium-large rolls that are split, toasted, and buttered for breakfast. When I tried a smaller version of these rolls for a celebratory dinner, the guests got little leaden chunks instead of feather-light rolls. 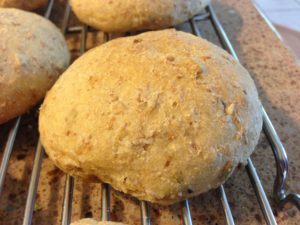 The first time I made these rolls on the Eastern Shore, there was no Bob’s Red Mill 7-grain hot cereal mix at Quail Cove, our local whole food supplier, so I used half 5-grain and half 10-grain Bob’s Red Mill hot cereal mixes. After trying the 7-grain mix another time, I went back to the combination of 5-grain and 10-grain. It turns out that the 5-grain mix contains 5 of the same grains as in the 10-grain mix, but they are processed differently. I’m still going to call it 15-Grain Breakfast Bread. I have always found Bob’s Red Mill products entirely satisfactory. Since our recipe for what is known around here as “Seed Bread” was put together, Bob’s Red Mill now offers 6-grain and 8-grain hot cereal mixes. We look forward to trying them soon. If you are using the seeds, roast them in a skillet over a medium flame for a few minutes until they start to pop. Add honey, yeast, and salt to the mixer and stir to combine. Add buttermilk. Add flours until dough cleans the sides of the mixer. Turn off mixer and let dough rest for 20 minutes. Knead on medium-low speed for 7-8 minutes. Add seeds if you are using them and mis until seeds are evenly dispersed, 1-2 minutes. Place dough in large bowl, cover, and allow to rise until doubled, about 90 minutes. You can also put the bowl and dough in the refrigerator to rise overnight. Remove it at least 2 hours before you shape the rolls to allow the dough to return to room temperature. Shape into 24 rolls (or 36 rolls if you are using the Recipes and a Half) and place on 2 or 3 baking sheets. Cover and allow to rise until doubled, 45 minutes. Heat oven to 400°F. Bake 15-20 minutes. Remove from oven and cool rolls on wire rack. Roast the seeds in a skillet over a medium flame for a few minutes until they start to pop. (If you have no flame or skillet, you can use the broiler of a toaster-oven for 2-3 minutes). Put all the other ingredients in bread machine and mix until dough cleans the sides of container. Turn off machine and allow dough to rest for 20 minutes. Add seeds if you are using them. Knead for 7-8 minutes. Remove dough from machine and place into bowl. Cover and allow to rise until doubled, about 90 minutes. Shape into 12 rolls (the rolls will be slightly larger than those in the regular recipe) and place on a baking sheet. Cover and allow to rise until doubled, 45 minutes.